John Galinetti is the founding pastor of Mount Hope Church, a growing church in Grand Blanc Michigan. He and his wife Wendy started the church in 1988. Relentlessly, Pastor John has dedicated himself to help people maximize their personal and spiritual potential for the cause of Christ. Pastor John is heard daily on popular radio stations. His upbeat and motivating program called "The Pastors Minute" reaches more than 60,000 commuters and offices who make it a regular part of their work day throughout Michigan. The miraculous recovery from of a fatal Jet Ski accident in 2009 has not slowed his pace or motivation. His passion and drive is evident as he continues to fervently preach the gospel in 18 nations including cultural centers, packed out stadiums and sporting arenas. Pastor John holds credentials with the Michigan District of the Assemblies of God and is a graduate of Global University and Rhema Bible Training Center. 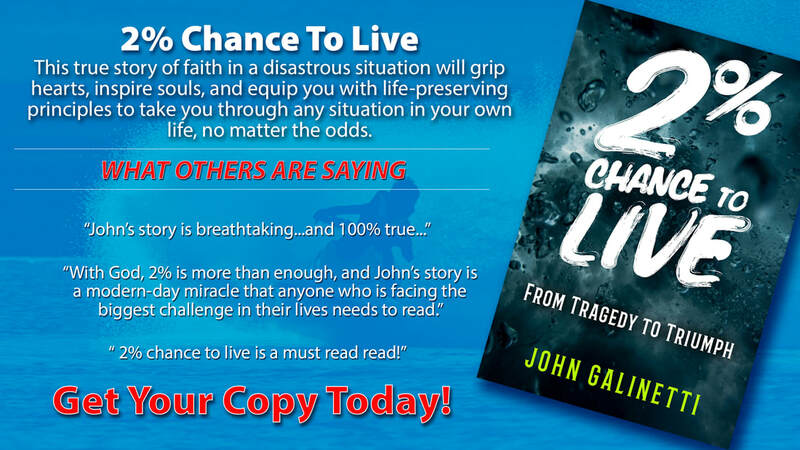 He has authored two books, Progressions Of Faith and 2% Chance To Live. He has also been featured on the 700 Club television program. Pastor John is an avid Michigan football fan, outdoorsman, and loves spending time with Wendy and their four children. To own your copy of this amazing testimony and for more information regarding this miracle, click the photo above.